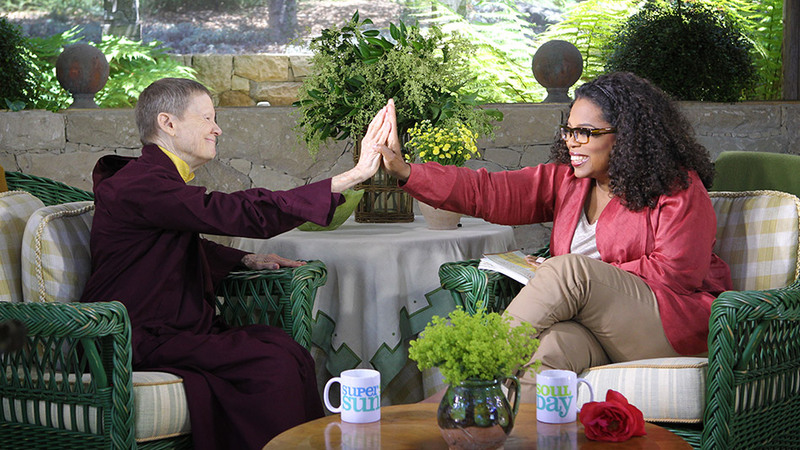 Yesterday, Oprah welcomed prolific author and world-renowned Buddhist teacher Pema Chödrön to Super Soul Sunday. Born Deirdre Blomfield-Brown in 1936, she followed a conventional path, attending a prestigious prep school and college before marrying and having children. Later, she divorced and married a second husband who, in turn, left her at age 35. Shocked and traumatized, it took her three years to grieve and then forge an extraordinary spiritual path from wife/mother to ordained Buddhist nun. Pema learned to embrace her authentic self at Gampo Abbey, a monastery on Cape Breton Island (Nova Scotia) where she is resident and teacher. Throughout the telecast, Pema focused on what to do when one’s life falls apart. The knee jerk reaction is to run away. Instead, Pema recommends the practice of compassionate abiding with oneself: Breathe in the suffering (unwanted discontent) and be open to it. Be right there with the feeling, taking note of all thoughts. Then, breathe out and create a lot of space. She gently reminds us that nothing wrong has happened. Life is simply pointing us in a different direction. If you don’t know the nature of fear, you can’t be fearless. The sun is always shining in the rain. It never went anywhere. Let go of fear and ego to embrace your authentic self. If you’re invested in security and certainty, then you are on the wrong planet. We are one blink away from being fully awake. 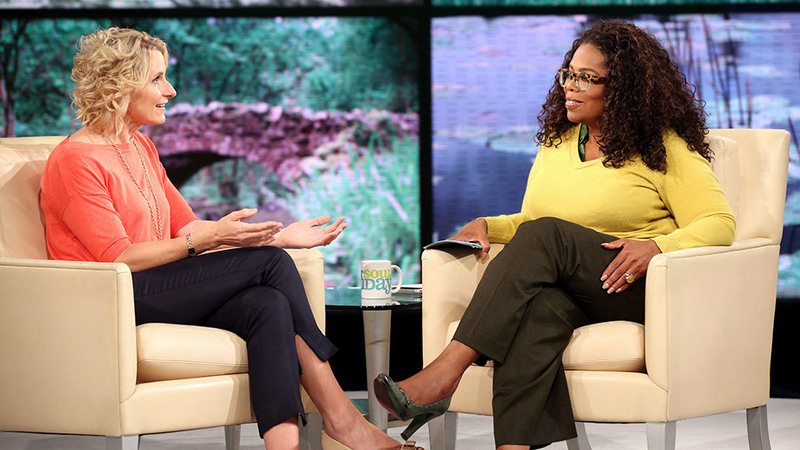 Oprah welcomed author and spiritual trailblazer Elizabeth Gilbert to Super Soul Sunday. The telecast focused on the lessons inherent in Eat, Pray, Love, the book that sparked a revolution and inspired a generation of women around the world to start their own journeys. It is not surprising that the book was translated into 46 different languages, sold over 15 million copies, and spent over 200 weeks on the best-seller list. Interestingly enough, Elizabeth had not planned on starting a revolution. At a critical juncture in her own life, she realized that staying in her marriage was scarier than choosing to honor the call: What have I come here to do with my life?” Elizabeth’s call took her on a transformative journey—a hero’s journey— to Italy, India and Bali. The hero’s journey starts with a call, a call that you can choose to pursue or ignore. If you decide to answer the call, the trials will begin. You can expect to feel hurt and challenged at every turn, but if you persist, each obstacle will prepare you for your battle. In India, Elizabeth faced her demons while spending grueling hours in meditation. She finally realized she was the mother of all those orphaned parts—failure, fear, anger and shame—and that she was in the driver’s seat. At age 28, the woman’s husband walked out, leaving her with five children, aged two months to ten years of age. Alone and poor, the woman made a promise to herself that someday she would see the world. She took out a coffee can and started depositing $1 each. She continued for twenty years, not touching that money. After all her children left home, she bought a ticket and sailed the world. This story sparked a “Coffee Can Revolution” among Elizabeth’s readers and fans. Eat, Pray, Love provided women with a permission slip: Honor your own life and ask what serves you. Perfectionism is a haute couture form of fear…fear in really good shoes. Any inner voice that attacks you is not your highest self. Good whispers will exalt you, and bad whispers will appall you. You usually don’t choose change until the status quo is scarier than the transformation. God is Grace…God is whatever lifts your face out of the dirt. There’s always another level up. There’s always another ascension. 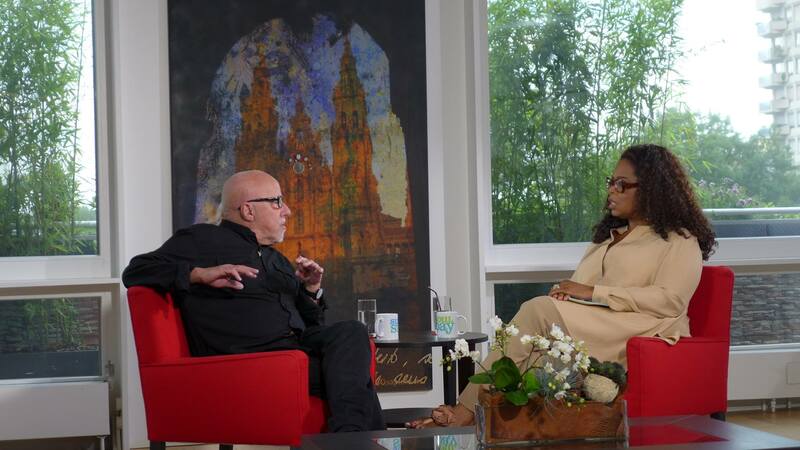 Yesterday, Oprah welcomed bestselling author Paulo Coelho to Super Soul Sunday. 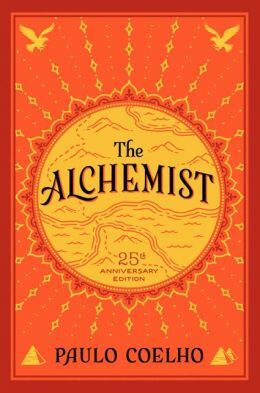 Paulo is celebrating the 25th anniversary of a true phenomenon: The Alchemist. Since publication, this magical allegory about an Andalusian shepherd boy named Santiago who travels from Spain to Egypt in search of treasure has broken all records. Over 65 million copies have been sold and it is the most translated book in history. I was fascinated by Paulo’s early history and the near-death of The Alchemist. Born into a middle- class family in Rio de Janeiro, he was expected to follow in his father’s footsteps and become an engineer. When Paulo rebelled, his parents bribed him and, when that failed, they committed him to a mental institution from which he escaped three times before being released at the age of 20. Paulo made it clear that his parents truly loved him but were not comfortable with the idea of a son following a creative path. Originally, Paulo launched The Alchemist through a small Brazilian publishing house. Initial sales were dismal and the publisher decided not to reprint. Passionate and committed to its success, Paulo found a larger publishing house and from there the book took off. Both Oprah and Paulo stressed the book reached the critical masses because of famous (Bill Clinton, Madonna, Will Smith) and more importantly, anonymous readers. Throughout the telecast, Paulo shared wonderful observations and insights. Paulo believes that God will ask: “Did you love enough?” Here, Paulo is not referring to romantic love but whether we are able to open our hearts to embrace every grain of sand. And, when you want something, all the universe conspires in helping you get it. 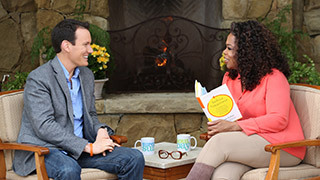 Yesterday, Oprah welcomed Shawn Achor, author of the international bestseller, The Happiness Advantage, and Before Happiness, to Super Soul Sunday. Throughout the telecast, Shawn shared concepts and strategies from his books and the Happy course he teaches at Harvard. With one out of every six students enrolled, the course is more popular than economics. According to Shawn, we must define happiness before we can be happy. And therein lies a major obstacle. Most people mistakenly believe happiness will be experienced when goals are reached. Unfortunately, success is a moving target. Shawn urges us to get rid of this scientifically-broken model and redefine happiness in terms of joy. He admits that happiness is an easier choice for some people, but each of us can improve our baselines for happiness by rewiring our brains. When you wake up, come up with three different things for which you are grateful. Think of one meaningful thing that happened in the last 24 hours and write every detail you can recall about it. Send a thank-you email, tweet or FB message to one person you know. Simple meditation–Watch your breath go in and out. Happiness is the joy we feel striving toward our potential. Joy is inextricably linked to meaning. The opposite of happiness is apathy. Being successful doesn’t make you happier. Being happy makes you more successful. Happiness is a choice and a practice. It doesn’t matter if the glass is half-empty or half-full if there is a pitcher nearby to refill it. 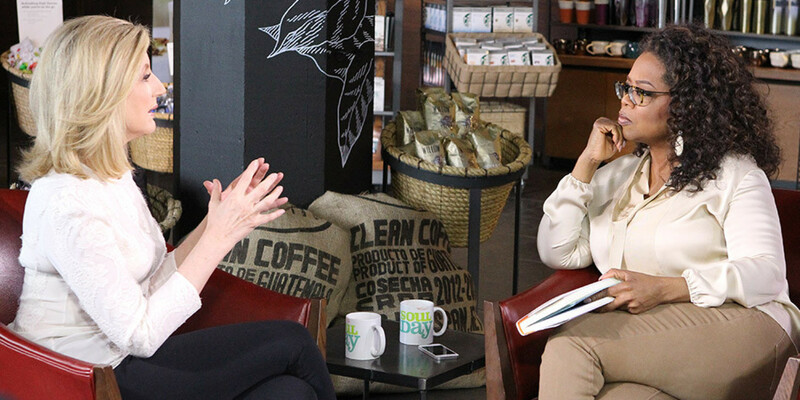 Yesterday on Super Soul Sunday, Oprah and Arianna Huffington chatted about mothers, success, and spirituality while having tea at at Starbucks. Well known and acclaimed as one of the world’s most influential people, Arianna attributes much of her success to her mother, a woman who provided her daughters with unconditional love and an enriched upbringing, despite modest beginnings in Athens. After selling all their belongings, the family moved to England where Ariana obtained a scholarship to Cambridge University. At age 21, she held the distinction of being the first international student to become president of the famed debating society, The Cambridge Union. After moving to New York in 1980, Arianna married, had two daughters and become politically involved. In 2005, she founded the Huffington Post, a news and blog site that quickly became one of the most widely-read media brands. But this success came at a price. On April 6, 2007, Arianna collapsed from exhaustion and woke up to find herself lying in a pool of blood. This wake-up call forced Arianna to ask the difficult questions about success and the true meaning of life. She eloquently speaks about this search in her fourteenth book, Thrive: The Third Metric to Redefining Success and Creating a Life of Well-Being. We must disconnect with technology to reconnect with ourselves. To improve the quality of her sleep, Arianna transformed her bedroom into a device-free sanctuary. Take a nap in the afternoon. There are two (well-used) nap rooms at Huffington Post and Arianna is planning to add a third room. Give up what no longer works. Several years ago, Arianna found it liberating to drop several projects that were no longer relevant or necessary. Life is a dance between making it happen and letting it happen. A eulogy has nothing to do with our resume. We can integrate death into our lives, not in a morbid way but to give life meaning. Failure is part of the journey to success.